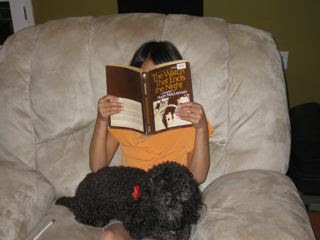 Child #4 snuggling with Dorothy the Dog and pretending to read my very own copy of The Watch that Ends the Night. This book, BTW, will be re-released in May. Cover copy (from McGill-Queen's University Press): George and Catherine Stewart share not only the burden of Catherine's heart disease, which could cause her death at any time, but the memory of Jerome Martell, her first husband and George's closest friend. Martel, a brilliant doctor passionately concerned with social justice, is presumed to have died in a Nazi prison camp. His sudden return to Montreal precipitates the central crisis of the novel. Hugh MacLennan takes the reader into the lives of his three characters and back into the world of Montreal in the thirties, when politics could send an idealist across the world to Spain, France, Auschwitz, Russia, and China before his return home. 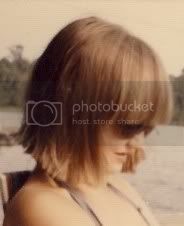 I think it's pretty universally accepted that Catherine Stewart is based on MacLennan's own wife and her illness. Everyone also agrees that one of the minor characters takes after William Lyon Mackenzie King, a Canadian Prime Minister. Here's the first line: There are some stories into which the reader should be led gently, and I think this may be one of them. Simply put, Hugh MacLennan defined Canadian Literature. He's one of our favourite and greatest authors. He wrote about Canadians and Canadian politics which paved the way for other Canadian writers to do the same. (Ironically, MacLennan's first two novels, which were never published, were about his travels abroad.) MacLennan pulled off something as yet unmatched by any others: he was awarded FIVE GOVERNOR GENERAL'S AWARDS (3 for fiction, 2 for nonficiton). The Watch that Ends the Night was his third GG. Hugh MacLennan (1907 -1990). John Hugh MacLennan was born in Nova Scotia. He studied at Dalhousie University, was a Rhodes Scholar at Oxford and did his doctorate at Princeton. Not just your average Joe! He taught at Lower Canada College and later became a prof at McGill University in Montreal where he taught in the English Department for THIRTY YEARS. He married Dorothy Duncan, an American writer. A couple of years after his first wife's death, he married Aline Walker. And, lastly, I leave you with a music video of The Tragically Hip (a Canadian group of four guys from Kingston, Ontario that was massively popular in the early 80s. This is The Hip (their nickname) singing their song "Courage (for Hugh MacLennon)"
p.s. Sorry for the incredibly long post. I really got carried away with all the tripping down memory lane! It sounds like a very powerful and interesting book! What memories you bring, Barrie! Famous Canadian authors, Montreal and music from the 80s. I lived in Montreal in the mid-80s on Summerhill off Cote-des-Neiges. Barbara, I think if we get together the next time I'm in T.O., we'll stay up far too late. We're both such night owls! No apologies - was happy to join you on the trip. Reminded me of my Canadian Lit course in university and reading MacLennan's work. THat was nice getting to know that part of your history. I hate when I discover too late, paths I crossed but didn't know it... Robert Frost's The Road Not Taken in another light. So, if you lived in Quebec, do you parlez vous Francais? Love the personal and the wonderful pic. Thanks! I must confess to not knowing anything about him. But I have liked the Tragically Hip for a long time. Lana, who lived in Canada for years, is a big fan and turned me on to them. New Orleans is sinking, and man I don't wanna swim. I am going to go and find that oldie, but goodie! I just read the new Wally Lamb book...OH! My! He sure does not disappoint! I cried the last 45 pages!!! Well, sobbed actually! What a fabulous first line! Sounds like it'll be great! Also, I couldn't see the link to The Tragically Hip so I'm bopping over to YouTube to check them out! You know, I can't remember if I have read that book or not even though I can see it on my book shelf from where I sit. I have read Barometer Rising a number of times though and am just about to re-read it. Thanks for sharing this - and the video (which I didn't know was for Hugh). I did a review of you book today. Hope you like it as much as I did reading I So Don't Do Mysteries. I'm in love with that first line. It makes me want to read the whole book. How exciting that it will be re-released! My brother went to Bishops and we used to go visit him and stay in a BnB in North Hatley! It is so beautiful there. Lake Memphrémagog and the surrounding mountains. Phew. Now I am intrigued, I am not 'allowed' to watch theb vid, its not allowed in my country, what on earth is it???? Quickly, follow the unknown with something more familiar. Courage, it couldn't come at a worse time. Sheri, I do speak French. Although I get to use it so rarely now, that I'm probably tres tres rusty! Barrie you are so cool!